Dupatta is a long scarf-like fabric worn by ladies in Southern Asia. Dupatta is usually known as the chunnari, odhni or chunni. Dupatta style is viewed as an image of unobtrusiveness and compliments the general look of salwar suits, lehenga and sometimes even an anarkali. The dupatta is a brilliant swathe of womens clothing which motivates sentiment, a reality that has been exhibited for quite a while, and since the entry of film. A fancy dupatta is a great piece of flexible garments and a bit of apparel. Dupatta designs can be worn in various courses, with various distinctive pieces of clothing, in various styles. The bunch outlines, examples, hues and adornments are overpowering as for the dupatta designs! Every district has its specific manner of giving the dupatta style remarkable embellishments, weavings, textures, and weaves. The most widely recognized textures for dupatta are Cotton dupatta, Silkdupattas, Chiffon, and Georgette dupatta. It is astounding and overpowering to discuss the sort of assortment that the designer dupatta encapsulates. It wasn ’ t great long prior that the bridaldupatta was a huge part of the custom and esteem arrangement of each Hindu family. With time it showed up in the field of design and was displayed on the extra large screen by amazing divas. The thoughtful pieces of clothing soon experienced a great deal of consideration to wear distinctive countenances. The conventional dupatta designs have been worn in endless parts of South Asia since hundreds of years. The general population of Vedic India wore three pieces of clothing – nivil, vasas, and adhivasa. The adhivasa was an article of clothing like the dupatta style of present circumstances. Amid the Vedic circumstances, the dupatta was worn both by men and ladies, not at all like the present day situation. The bridal dupatta as well as bandhani dupatta with time slowly developed and went ahead from being a texture for viable purposes to something that complimented the general dressing of a lady, for example, organizing suits. The surging length has been decreased from more than two meters to around two meters. At in the first place, the bandhani dupatta was utilized to cover the head and abdominal area and was worn with ghagra choli or salwar kameez. The thought process was unobtrusiveness and furthermore a sign of regard towards the family older folks. The well-established routine with regards to women covering their heads while setting off to a position of love still exists. Net dupattas: Net Dupattas are lightweight and simple to convey for the day. Net dupattas accompany exquisite and delightful weaving on them. They help to elevate the look of the dress or lehenga. Net dupattas enable you to flaunt your hairdo and hair embellishments. It is the only reason that net dupatta is listed in the list of bridal dupattas. This kind of dupatta is in a perfect world suited for summery and sweltering atmospheres. It is fitting to utilize a net dupatta to cover your head as the weight does not put overabundance weight on your neck and furthermore remains set up effortlessly with a couple of bobby pins. Georgette dupattas: Georgette dupattas are sheer works of polish. These dupattas styles are overwhelming and influence the outfit to look more rich and energetic. Attributable to the murky idea of these fancy dupattas, they are used to maintain the traditional culture of women as generally the neck areas and breast area get covered up. Banarsi silk dupattas: Banarsi silk dupatta types are most appropriate for layering and including a style articulation for your outfit. Such kind of heavy dupattas resemble shawls which are vigorously weaved. These fancy dupattas are not suited for wrapping over your head. They are hardened or heavy dupatta and give a vintage look to your outfit. 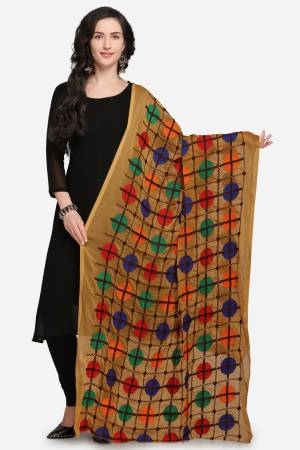 Banarsi silk golden dupatta is best to grasp it like a shawl and draw on a provincial look. Attempt it on a dark lehenga skirt and weaved pullover to look extraordinary. Chiffon dupattas: Chiffon dupatta types are more for every day utilize and for easygoing outfits. They are light and fragile and can ’ t bolster excessively weaving. Keeping a chiffon dupatta set up is greatly simplified and doing your day ’ s assignments wearing one is additionally genuinely basic. Some two-fold layer chiffon dupattas are accessible; these have fragile weaving close to the edges. Velvet dupattas: Velvet dupattas are all the more usually and famously known as velvet odhnis. These are exceptionally helpful amid the winters. They are thick, solid and heavy dupattas and furthermore weaved with substantial diamonds that influence them to look rich and ethnic. Velvet runs well with most materials and henceforth can make any outfit look splendid. The main downside is that a velvet golden dupatta can ’ t be hung around the head. Go for an extensive variety of the snappy wedding dupattas online shopping from Craftsvilla and extra some style to your looks. There is a colossal assortment that you will discover on Craftsvilla site. 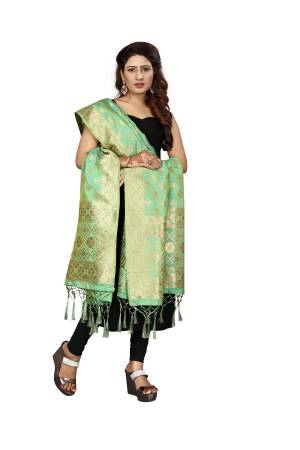 For your ordinary kurta-pants and salwar suits, you can shop from a colossal choice of cotton dupattas in shocking conventional and neo-customary outlines. 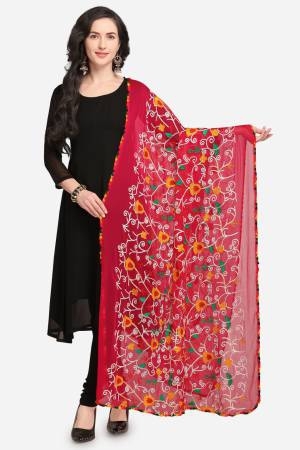 You can look at a plain, printed, and also heavy work dupatta online assortment. Pick the designer dupatta online that suit your desi style the best. There is an assortment of lovely bandhani dupattas that are genuinely conventional and can give you a legitimate hope to parade. You can wear these with your plain Patiala or Anarkali suits to add some fly to the look. For a legitimate look, you can likewise consider the assortment of bandhani dupattas that Craftsvilla conveys to you. They are the best when you need something staggering to run with consistent Indian clothing types. We additionally offer a tremendous scope of originator heavy work dupattas online that are ideal for your happy Indian outfits. They are weaved richly and can give you a stunning bubbly look. On the off chance that you need to save money on the sassiest dupatta designs for your looks, there are some incredible arrangements that you can profit. Aside from that, Craftsvilla additionally gives you some different offers to profit on dupattas online. Download the Craftsvilla Application to stay refreshed with every one of the arrangements that we have for you. The application additionally gives you a chance to shop effectively and rapidly through an enormous list that Craftsvilla get you. Contrasted and purchasing clothing at general physical stores, your dupatta web-based shopping knowledge at Craftsvilla is certain to be a flat out breeze. Our perusing, determination and installment forms are very straightforward and easy to use when you go to wedding dupatta online shopping. You can see all your most loved dupatta brands at one go. At Craftsvilla we likewise put stock in design being reasonable for all. The dupatta value alternatives from our first class marks are within a reasonable range. You can stock up on the same number of choices of dupatta online as you need!